From the outside, it looks like just another Penn Quarter storefront. But once you step inside, Riot Act (801 E St. N.W.) reveals itself as a rare destination in the downtown area: a comedy club. "It's another place to come to enjoy live entertainment, have a good time, laugh, drink, and do it all at the same place," manager Ted Xereas said. "It's for everyone, a place where everyone can come and enjoy themselves." The state-of-the-art facility can seat more than 500 people, and includes a giant movie screen, and two bars in the lobby. Patrons can nosh on appetizers and dinner entrees, including quesadillas and ribs. Servers continue service throughout shows to make sure your stomach doesn't growl. 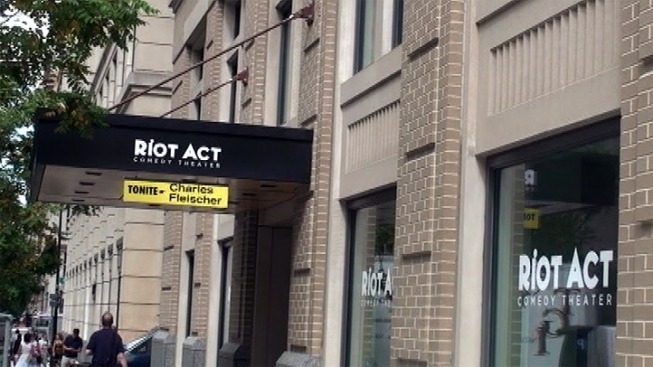 Riot Act is one of just a handful of comedy clubs in the District -- and the only one that hosts an open-mic night solely for comedy. Open-mic nights are every Tuesday night. Hundreds of people showed up for the very first one. Among those was Chipp Jones of the District. After a couple years of practice, he wanted to see how he'd be received. "I'm looking forward to getting up on the stage here at the Riot Act, looking over the crowd and telling jokes," he said. Toi'e Jones (no relation to Chipp) of Baltimore said she came out to support her friend. "I like the vibe [of the club], and I'm ready for some great comedy tonight," she said. In addition to open-mic nights, Riot Act will also host comedians, comedy troupes and some national acts. Upcoming shows include Gay-Larious (Sept. 7) and "Last Comic Standing" competitor Rob Cantrell (Sept. 8-10). For a full schedule, go here.